In order to design a medium-voltage cubicle, you need to know the following basic magnitudes: Voltage, Current, Frequency and Short-circuit power. The voltage, the rated current and the rated frequency are often known or can easily be defined, but how can we calculate the short-circuit power or current at a given point in an installation? 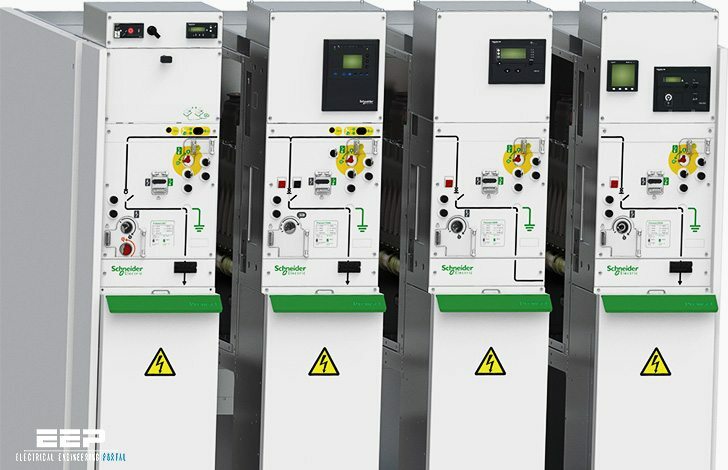 Knowing the short-circuit power of the network allows us to choose the various parts of a switchboard which must withstand significant temperature rises and electrodynamic constraints. Disconnection, control and protection of electrical networks is achieved by using switchgear. Metal enclosed switchgear is sub-divided into three types: metal-clad, compartmented and block. The short-circuit power depends directly on the network configuration and the impedance of its components: lines, cables, transformers, motors… through which the short-circuit current passes. It is the maximum power that the network can provide to an installation during a fault, expressed in MVA or in kA rms for a given operating voltage. The customer generally imposes the value of short-circuit power on us because we rarely have the information required to calculate it. Determination of the short-circuit power requires analysis of the power flows feeding the short-circuit in the worst possible case. Network incomer via power transformers. Power feedback due to rotary sets (motors, etc); or via MV/LV transformaters. Kindly cascade my personal gratitude to “Schneider Team” who put in their lot endeavor for integration of basic knowledge for design of MV switchgear and sharing to their associated esteemed customers and in particular to craving electrical professionals. Its really appreciable and indeed a very useful guide / hand book for day to day application. Thank you very for the very informative items that ive been downloaded. Thanks for your contribution to the growth of the profession. A new version of MV Design Guide by Merlin Gerin has been issued. Thank you very much Jean-Marc! I’ll update this page with new version. Thank you for sharing this ebook.